MIAMI, March 28, 2019 /PRNewswire/ -- Carnival Corporation & plc (NYSE/LSE: CCL; NYSE: CUK), the world's largest leisure travel company, today announced it has been recognized by the Human Rights Campaign (HRC) Foundation with a perfect score for the third consecutive year in its 2019 Corporate Equality Index (CEI), which rates U.S. companies on their treatment of LGBTQ consumers, investors and employees. 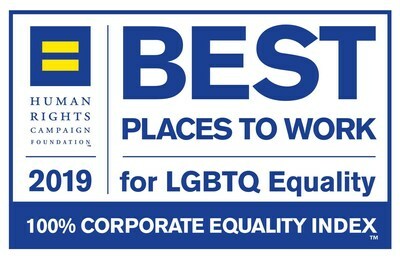 The index also recognizes Carnival Corporation with the designation of a Best Place to Work for LGBTQ Equality by HRC Foundation, the educational arm of America's largest civil rights organization working to achieve equality for lesbian, gay, bisexual transgender and queer people. Additionally, it is the sixth time the company has been recognized in the CEI report, which is the nation's premier benchmarking survey and report on corporate policies and practices related to LGBTQ workplace equality. "Being recognized by the largest LGBTQ civil rights organization in the U.S. with a perfect score on the CEI for a third year in a row is a great honor that reflects our ongoing commitment to equality, inclusion and diversity," said Roger Frizzell, chief communications officer for Carnival Corporation, whose nine industry-leading cruise brands are among the world's most popular and admired cruise lines, including Carnival Cruise Line, Cunard, Holland America Line, Princess Cruises and Seabourn. "We are dedicated to promoting a positive work environment for our more than 120,000 employees from over 150 countries that work with great passion to provide extraordinary vacation experiences for our guests. For us, diversity of thinking is a business imperative that provides a competitive advantage. We know that having people from different backgrounds and cultural experiences organized around a common objective is far more likely to create breakthrough innovation than a homogenous group." The announcement follows Carnival Corporation being recently recognized as one of America's Best Employers for Diversity in 2019 by Forbes Media, as well as being named to the first-ever NAACP Equity, Inclusion and Empowerment Index, which assesses U.S. companies on their commitment to racial and ethnic equity in every aspect of their business and operations. Additionally, Carnival Corporation's namesake cruise line brand, Carnival Cruise Line, was recognized in 2018 with both a Travvy Award and Women's Choice Award as the best cruise line for LGBTQ travelers. This HRC honor aligns with Carnival Corporation's 2020 sustainability goals, including a commitment to building a diverse and inclusive workforce and providing all employees with a positive work environment and opportunities to build a rewarding career to further drive employee engagement. Partnering with equal opportunity champions such as the Human Rights Campaign, Executive Leadership Council, Hispanic Association on Corporate Responsibility, Catalyst, Leadership Education for Asian Pacifics and CEO Action for Diversity and Inclusion. In its 17th year, the CEI evaluates LGBTQ-related policies and practices including non-discrimination workplace protections, domestic partner benefits, transgender-inclusive health care benefits, competency programs, and public engagement with the LGBTQ community.